Thank you for choosing a web host that uses DirectAdmin Web Control Panel. Because DirectAdmin has so many features, we recommend that you read the documentation on this site before creating customer accounts. This page provides you with basic "getting started" information. Users are known as end customers or site owners – they are people that need hosting. They use DirectAdmin to create e-mail accounts, upload files to their site, add subdomains, etc. The User panel allows them to do this. Resellers are also Users. Resellers, however, have both a User panel to modify their own web site and a Reseller panel that allows them to create User accounts. Admins are also Users and Resellers. Admins also have an Admin panel that allows them to create Resellers and manage the server. 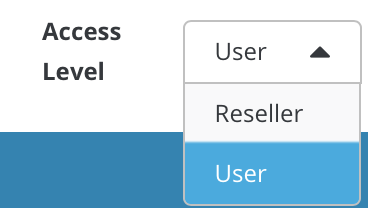 When you sign into DirectAdmin you will see your Reseller panel. To switch to your User panel, click the "User" link at the top-right corner of your screen. To switch back, click the "Reseller" link. Resellers have the ability to sign into the control panel as one of their customers (Users). 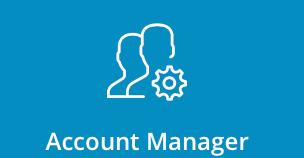 To do so, click on the "Account Manager" icon, followed by the "List Users" link. 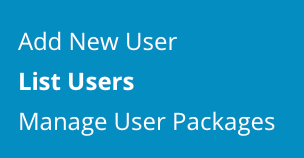 From there press on desired User you want to login with. After that, press "Login as [Username]" button. This feature is useful because you don't need the customer's password when they want you to check the functioning of their panel. When you create a customer account, you can tell DirectAdmin to send an e-mail containing all account details to that customer. If you choose to use this feature, you should set the proper e-mail address in your control panel, as these automatically generated e-mails will use that address in the "From:" field (making it look like you sent the message personally). To set this e-mail address, sign into your control panel and switch to your User panel. Second, return to the main menu and click on the "View More" button in "Your Account" section. From there you will see button. Confirm that the e-mail address in the box is accurate. Full documentation for the control panel is available to your customers at site-helper.com. Site-Helper.com is a generic help site that all hosts can use to support their customers. Or, if you prefer, you may copy Site-Helper's content and adapt it to make your own manuals (we allow all companies using DirectAdmin to borrow our documentation). DirectAdmin features a built-in ticket support system that allows customers to contact you directly through the control panel. If you prefer to offer support in a different way, you should disable the built-in support system before creating customer accounts. Please see the documentation on the message system for more information.